After some early week gains, crude prices remained mostly flat during yesterday’s trading session. Prices are trending lower this morning after a bearish API report. The EIA also released a bearish Short Term Energy Outlook revealing an increase in U.S. crude oil production over the February report, putting downward pressure on prices. This morning, crude prices lost 19 cents to trade at $62.41. Refined products are moving opposite of crude today, supported by inventory draws reported by the API yesterday. Both products traded flat to slightly higher on Tuesday. Today, diesel has gained a mere 16 points (.08%) and is currently trading at $1.9049. Meanwhile gasoline, which saw a larger-than-expected inventory draw, has gained 1.26 (.65%) cents since yesterday’s close, bringing prices to $1.9457 currently. Yesterday’s API report was mixed for the oil complex. Crude posted a build of 5.7MMbbls, exceeding market expectations by 3 MMbbls. 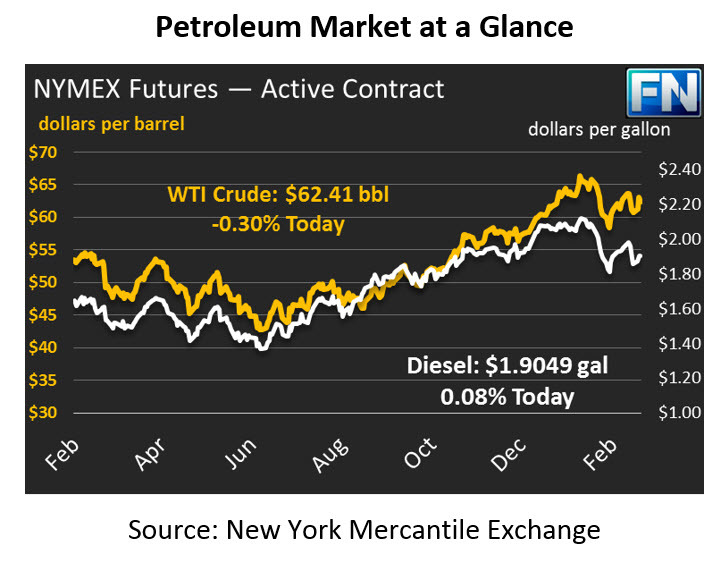 Gasoline also exceeded what the market expected, but in the opposite direction. Gasoline drew by 4.5 MMbbls, providing strength to prices this morning. Diesel inventories built by 1.5 MMbbls, contradicting the 1.2 MMbbls draw predicted by the market. The market is anticipating the EIA report that will be coming out later this morning. As mentioned above, the EIA released their monthly Short Term Energy Outlook report yesterday. The EIA expects liquid fuel consumption in the U.S. to increase by 2.4% in 2018, the highest growth rate since 2013. Crude oil stocks in Cushing, OK continue to decrease bringing inventory levels to a three year low. The Brent-WTI spread reached its lowest level in more than 6-months, narrowing to $3.03 on March 1, down from the $7 spreads seen in September 2017. A Reuter’s article citing vessel-tracking and port data showed that exports to Asia declined by 116,190 barrels per day in February, and is expected to continue to decline through March. If the Brent-WTI spread continues to narrow, it is likely that U.S. exports will begin to decrease, increasing U.S. inventories and sending prices lower.